There may have been a nasty snowstorm blowing through the evening of Nov. 2 but it did not deter scores of business people and citizens from taking in the sixth annual Rotary Night at the Innisfail Library Learning Centre. The evening, which featured the service club's annual wine tasting event, was a fundraiser for Rotary's planned nature trail development around Napoleon Lake, and to recognize the continued and valued contributions from the club's sponsors. "It is a good chance for the community to come and help sponsor and raise money for us and have a good evening and visit," said Rod Bradshaw, president of the Rotary Club of Innisfail. "The money we are raising tonight goes to some of our local projects. It helps the community and us sponsor our projects It is a win-win for us. It lets people know what Rotary does and how we help the community." Rotary's primary current project for the community is to develop a nature trail around Napoleon Lake, a partnership it has with the town. "It is going to start out very simple. Over the years we are going to develop it but it is going to be a multi-year project," said Bradshaw. "There has always been a kind of a walking trail but it is going to be a natural trail." He said the first phase of the long-term project, which will cost just under $10,000, is to install new benches, tables and garbage receptacles around the lake. Terry Welsh, the town's directory of community and protective services, said the "collaborative partnership" with Rotary will see six benches, two picnic tables and three garbage receptacles installed around the lake next spring. Bradshaw said that first step will lead to more ambitious initiatives at the lake. "Over the years the vision is to put in observation spots and there are a few places we are going to have to build some infrastructure such as stairs and bridges over the marshy areas," said Bradshaw. He said the plan is to develop the nature trail all the way around Napoleon Lake, a loop of more than a kilometre and a half that ends up at Centennial Park, which was the focus of another Rotary project several years ago. "We will see over the years as it develops there will have to be more drawings and engineering done. It will be interesting to see where it goes at the end," said Bradshaw. He said Rotary's original intent when the project was first envisioned was "much like a paved highway" with a three-metre wide paved path but it was later thought to be too "prohibitive". "We scaled it back and we've gone to where we will have a defined path. We are going to try and leave it as natural as possible," said Bradshaw. "We want people to enjoy it but we also don't want to convolute the natural pathway. "I think down the road there will be a more defined path where people can follow it all the way around and there will be observation decks to go and bird watch," he added. Meanwhile, the development of the nature trail around Napoleon Lake will only affect "indirectly" the future recreational amenities for the planned Napoleon Meadows residential subdivision, said Craig Teal, the town's director of planning and operations. "The reason I say indirectly is that Rotary was going to do the trail system around Napoleon Lake regardless of where we were going to do a subdivision on the Napoleon Meadows site, and the citizens there will be able to enjoy a nice walk along the west side of Napoleon Lake," said Teal. "When we do the development of Napoleon Meadows we are going to do some trail connections to connect the dots, so in that way it is related. It is common geography but two autonomous projects." Dana Meise is aiming to be the first Canadian to have walked to all three of Canada's kilometre zero signs. The Thunder Bay, Ont. man, who originally hails from Prince George, B.C., is in the sixth year of his journey to solo hike the entire 23,000-kilometre length of the Trans-Canada Trail - east to west, north to south. "I have touched the sign in St. John's Newfoundland. I will hit the one in Victoria in late November and in 2015 I will reach the sign in Tuktoyaktuk in the Northwest Territories," said Meise, who reached Innisfail on Aug. 27. And already, Meise can claim to be the first person to have hiked to Canada's easternmost point - Cape Spear, Newfoundland and Labrador - and to its most southern at Lake Erie's Middle Island. Meise arrived at the town's Tim Hortons tired and dripping in sweat. After pulling off his 50-pound backpack he was grateful for the free coffee and sandwich given to him by restaurant assistant manager Christine Pasillao. "I feel pretty good," he said. "But once that heat gets hold of you I get pretty tired." But every step of the way has been worth it for the 39-year-old forestry technologist. He said his goal to learn more about Canada and its people from every corner of the country has been "amazing." "I had no idea how astounding and cool Canada is," said Meise. Meise's cross-Canada hike along the Trans-Canada Trail began in 2008. That year, he walked 1,750 kilometres, followed by 2,450 in 2009, another 3,215 the next year, 2,450 in 2011 and 2,750 last year. When he arrived in Innisfail last week he estimated he had hiked 1,390 kilometres this year since setting off from Saskatoon on June 6. He would have gone farther each year but for three of them he was injured with a case of plantar fasciitis, a painful condition caused by the overuse of tendons on the backside of his feet. "I think most people don't realize how unbelievably complex the trail is," said Meise. "It is especially so on the Prairies. You go along a grid road for two kilometres and then you might turn left, and then right and then left again. And it is not signed in places." But despite that obstacle Meise will not complain. So far he has walked through more than 800 towns and cities. His learning experience of the country he loves has been more breathtaking than he could have possibly imagined, especially through Quebec. "The number one place so far to hike through has been Quebec. They have the best section of the Trans-Canada Trail," said Meise. "I loved Quebec. It is exactly the opposite of what many people said it would be. "For people who were supposed to be anti-Canadian they are so very Canadian," he added. "But Newfoundlanders were by far the most patriotic." As for Alberta, he said he has been impressed with the province's "beautiful" towns but he did add that he went completely unnoticed in Edmonton, except for one homeless man. "Aside from that, not one single human being stopped to talk to me," said Meise, who used the Edmonton experience as yet another lesson about Canada. "Homeless and First Nations people who have always had to walk have been the kindest to me." Next year Meise will begin the final portion of his journey when he sets off from Fort Saskatchewan and heads up to Canada's Arctic. He will hike all the way to Inuvik, and then take a canoe to Tuktoyaktuk. "When I said I was hiking through all of Canada I meant it," said Meise, who is planning on a documentary film and book, The Great Hike - A very long walk on the Trans-Canada Trail for 2017, Canada's 150th birthday. "It's a big project." When Dana Meise began his cross-country trek on May 6th, 2008 he set out from Cape Spear, Nfld. to be the first man to walk the entire 23,000 km Trans Canada Trail. He has walked more than 13,000 km, walking six months straight out of the year for five years. Meise's mission is in honour of his father and he's also aiming to help unite people across Canada. Although Meise, 39, calls Prince George, B.C. home where he works as a forest technician when he is not walking, he now refers to himself as a "Homeless man with direction. "It's two days walking in Red Deer, because you have almost the same amount of trails as Edmonton does," explains Meise. "Edmonton has 47 kilometres and Red Deer has 40 kilometres." Meise explains that the Trans Canada Trail was originally founded in 1992 by two doctors - one is an astronaut who designed them to connect the old rail lines and to get people out and exploring. "The idea behind it is to connect communities and it is more romantic. If you are standing on the Trans Canada Trail right now I bet someone in Newfoundland would be too." Meise once called Red Deer home when he lived here with his father many years ago. It was here that Meise's life was changed forever at the age of 12 when his father, Ronny, suffered a brain aneurysm. His father embarked on a five-year journey to learn to walk again until he suffered from a later stroke and lost the ability to walk. It is for his father and for his country that Meise now heads down the historical paths that line our beautiful country. "No one has ever done it and it is almost impossible for people to comprehend how complex the trails systems are," he said. "I've had lots of people email me and tell me they are going to try to do what I'm doing but no one realizes how complex and challenging the trails are, so no one else ever gets further than a thousand kilometres and now I've walked the equivalent of twice across Canada or three times across the U.S. by myself." Meise has learned much about himself and his country while on his journey, as well as a great deal about the power of community. "It's a completely different world than people can imagine," said Meise. "Just the self-motivation to get up in the morning and walk 30 kilometres is tough. I have no support team with me daily, no one to tell me to wake up and get going in the morning, no one there when I was by myself down and out laying on a rock by Lake Superior screaming what am I doing?" 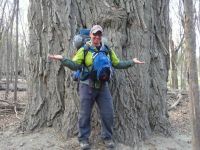 Although Meise travels alone, his online presence grows daily via his followers on twitter (@thehikingfool), facebook, and his blog www.thegreathike.com. Meise states that his main idea behind the walk from the very beginning was for the purpose of the book that will be to follow, in which he is writing as he goes. "My hopes for the book are that somebody from Alberta picks it up and reads it and says 'Holy he really did his research and maybe he will learn something about his own province'," said Meise about his book. "Or maybe someone from New Brunswick will pick up my book and read about Alberta and think 'Oh maybe Alberta is different than I thought' and come visit." He will be the first to admit that his values have changed along the way and that as he travels across the country on his journey, he is also travelling towards being a better person. "It's very humbling to have just your backpack and be in the middle of the prairies and see how you get treated," said Meise. "I've had women not want to sit beside me because they thought I was some street bum, I've had garbage thrown at me so I know what it's like to be homeless and these are my fellow Canadians who if I met under different circumstances would greet me with open arms." Meise restates that Canada was founded on the principle of helping your neighbour and he wishes more Canadians would just help one another. "No matter who you are or who they are, give without receiving and that could mean anything - a smile or more. "What are you in such a hurry for? You have to get home and watch TV? Try living a good life and helping someone and turning off the TV set. You can honour those people that helped make our country the way it is by volunteering and giving back to your community." Meise will continue his journey from Red Deer to Olds and onto Calgary with the hopes of spreading the word of community and humility on his journey to conquer our country's trails. "When you lose that big truck, your car, your house and your TV, who are you now? What would you have left?" said Meise. "We've got one shot at life, you have to make it whatever you want. Sure I will have spent eight years of my life walking, but what did I really give up? My truck?" After hiking more than 13,000 kms across Canada Dana Miese had a chance to see something he hadn't seen since he was a teenager, the house in Red Deer he lived in when his life was changed forever. Speaking Thursday as he was approaching the pedestrian bridge, formerly the CP rail bridge, from the south Miese said he lived in a white house in what is now Riverside Meadows in the mid-1980s. "The reason I'm doing this is my dad had a brain aneurysm when I was 12 years old in that old white house by the railway track that I'm about to see for the first time in a very long time," said Miese, 39. Miese's father was in a coma for five years in an Edmonton hospital after suffering a brain aneurysm. "This is the first time I'll see the house that changed my life forever," said Miese. "It took my dad five years to learn how to walk again efficiently, but then he had a stroke and lost the ability to walk. "My dad is my best friend, he's awesome, nothing gets his spirits down. His favourite thing to do was for him and I to walk. So I told my dad 'everyone talks the talk, I'm going to walk it and I'm going to walk enough for the both of us.' Here I am 13,000 km later." Starting on May 6, 2008, in Cape Spear, Newfoundland, he set out with a goal to cover 23,000 km on a solo hike across the Trans Canada Trail. He has been to more than 800 cities and (towns) on his journey. He typically walks six months per year. "In Manitoba, my family was brought over in a Red River boat, dropped off just south of Winnipeg," said Miese. "Now the old cart trail, into Winkler has been turned into the Trans Canada Trail. I walked through the town where they had to be registered and I walked to where they settled and to this maple tree where my great great grandparents were married." On Thursday he had walked more than 30 kms and said when he finished he will be happy to have set a record for a solo hike, something that will be next to impossible to take away from him. Throughout his walk he has taken video, pictures and written some of his experiences down with plans to write a book and film a documentary. He hasn't picked a publisher yet, but has drawn interest and is considering self-publishing. The groundwork has been laid for a recreational trail linking Penhold, Bowden and Innisfail, but any potential work on the ground is likely a long ways away. The three towns and Red Deer County have partnered to investigate the possibility of building a regional trail that would link the communities. Through a committee made up of representatives of the four jurisdictions, a concept plan has been put together that presents three possible routes a rural trail could take. In the Regional Trail Concept Plan prepared by Edmonton-based firm RC Strategies, a trail from Penhold to Innisfail could range from 8.6 km to 17.8 km long and could travel along routes near the C&E Trail, the Red Deer River valley, or Highway 2A. A trail from Innisfail to Bowden, it suggested, would be around 11 km long and could utilize an abandoned rail line or connect the Bowden Institution to the trail system. The concept plan would also see the three towns further develop their municipal trail systems. The report estimates capital costs for trail development to be anywhere from $29,800 at its simplest to over $6 million for a fully-developed trail. Annual operating costs could be in the range of $29,800 to over $200,000. Red Deer County councillors voted Tuesday to move forward with trail discussions, though concerns were raised about any future financial contributions it could be expected to make. The next step in the project steering committee's work will be designing a consultation process to gauge public and stakeholder interest in the proposal. The development of a trail linking the communities would require extensive negotiations with landowners in rural areas, and the province and CPR where the trail is near highways and rail tracks. The trail could become part of the proposed coast-to-coast-to-coast Trans Canada Trail system, which is to be completed by 2017 for Canada's 150th birthday. The Central Alberta Regional Trails Society (CARTS) helped spearhead the initiative and has a representative on the steering committee. The steering committee is hoping funding for the project can be accessed through grants and corporate and private donations. In the last six years, about $1 million has come in to support trail development in Central Alberta through grant money, said CARTS president Debbie Olsen. 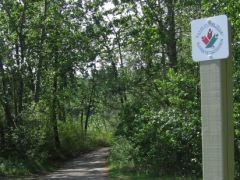 Most recently, a rural trail many years in the making linking Lacombe and Blackfalds received funding from Alberta TrailNet and the Trans Canada Trail Foundation. Still, Olsen said the towns and counties that will benefit from trails "have some obligation to help to fund them." The concept plan cost $25,000 to put together, with grants from Alberta TrailNet and the Trans Canada Trail Foundation contributing $17,500 to its completion. The remaining portion was cost-shared between the three towns and Red Deer County on a per capita basis. Penhold council reviewed the report in July and accepted the trail committee's request to continue participating in the project. Bowden council, however, is deferring any further discussions on the initiative until 2014 budget deliberations, said the town's chief administration officer Andy Wiess. Council believes the project is a good thing, said Weiss, but will wait to see if there is money available in its 2014 operating and capital budgets before deciding on whether to proceed. "Build it and they will come @TCTrail ...Meet Horst & Ursula from Leverkusen Germany who spend summers here in Canada. They tell me the LOVE the Trans Canada Trail and they use it to cycle from Red Deer through Blackfalds then Lacombe and back quite often to visit friends who live on or near the Trail. I met them while hiking along myself. That same day I also met a family from Chilliwack BC who often hike their section of the TCT back home and loved this section as they stopped to chat hoping to meet me in BC. I've seen time and time again built trail like this being used for a safe way to go out and get some exercise without the worry of traffic. It was such a pleasure to walk it and I'm very grateful to the wonderful people of Lacombe & Blackfalds Alberta. Well done and you did it with class. Thank you for setting such a great example of community spirit and I hope you inspire other communities to do the same. Signed; Mr. HAPPY!" 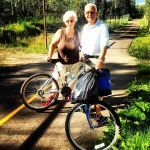 Last year Edmund Aunger's wife died in a collision while the Edmonton couple was bike riding in Prince Edward Island. Elizabeth Sovis had recently retired and, as an avid cyclist, had wanted to work towards helping the completion of the Trans Canada Trail. The two had just started a holiday on P.E.I. when they had to bike four kilometres on a highway to get to their bed and breakfast, something Sovis would never have attempted under normal circumstances. "There was a route marked on our cycling guide that was for cyclists," said Aunger. "It turned out to be a two-laned highway with no shoulders. Something my wife never would have cycled on. We wouldn't have even gone to P.E.I. if she had known she'd have to cycle on the highway." The couple got 2.5 km in to the four km stretch when she was hit by a van and killed. Aunger said they chose P.E.I. because it supposedly had the best, safest and most complete network of Trans Canada Trail in the country. Upon retirement Sovis decided she would spend the first few years of her retirement getting the Trans Canada Trail built, specifically in Alberta. "I quit my job shortly afterwards and decided I would try to work to get the Trans Canada Trail finished," said Aunger. Aunger plans to fulfill his wife's goal of supporting the completion of the trail by cycling from Victoria to Charlottetown over the next four years. This year he has cycled from Victoria to Red Deer, but plans to finish up in his hometown of Edmonton within a week. "Every summer when we did our cycling I made the plans and tried to keep to trails," said Aunger. "So we wouldn't have to go on the roads and it was a problem. Alberta and Saskatchewan are the two worst provinces in Canada for building the Trans Canada Trail." He said while provincial governments like Alberta and Saskatchewan haven't stepped up and fulfilled their end of the bargain in completing the trail, while municipalities like Red Deer, Calgary or Edmonton do a great job of having their own trails. Because of the municipal-centricity of trail development Aunger has found he has to crisscross his way through Alberta to ride Trans Canada Trails. After cycling from Blackfalds to Lacombe he has to go out to Pigeon Lake for the next stretch, and then to the other side of Hwy. 2 to Wetaskiwin for the next section of the Trans Canada Trail. "We tried to ride in Alberta and it was very frustrating because we would get started on a trail and it would end and we'd have to go out on the highway and pick up the trail somewhere else and then go back on the highway," said Aunger. Sovis felt strongly about riding in Alberta, but due to the frustration they mostly rode in Quebec, B.C. and Manitoba, where Aunger said the trails were better and actually connected. He wants an action plan to ensure the completion of Alberta's part of the Trans Canada Trail, as promised, by July 1, 2017. The original goal of the Trans Canada Trail was to be completed by Canada's 150th birthday. Cyclists, joggers, hikers and cross-country skiers could soon travel between Penhold and Bowden via a proposed regional trail network. The communities of Bowden, Innisfail and Penhold, along with Red Deer County, are exploring the possibility of creating such a trail system and an Edmonton-based consultant has prepared a report on the feasibility of building and maintaining the network. Although a number of steps need to be taken before a finalized design of the trail system is undertaken, RC Strategies does lay out a number of proposed routes in its feasibility report for trails within the three municipalities and Red Deer County. In Penhold, the proposed route would use an existing network of trails with the addition of roughly 2,200 metres of new paths to connect to three potential routes that would extend from Penhold through the county to Innisfail. The first of the three connection options is a 17.8-kilometre trail from the west edge of Penhold, via Highway 592 to the Red Deer River Valley that would link to a trail at the northwest edge of the Innisfail town limits. The second option would span 14.4 kilometres and also go from the west edge of Penhold via Highway 592 to the Calgary and Edmonton Trail, connecting to the north edge of Innisfail. The third option would extend 8.6 kilometres from the south edge of Penhold, via Highway 2A, and connect with trails at the northwest edge of Innisfail's town limits. Each of these routes would require approval from the province as well as negotiations with private landowners whose properties lie along these routes. Innisfail also has an existing trail network but connections are needed to bridge gaps between the developed areas of town and the town's boundaries. Three proposed routes spanning between roughly six and seven kilometres include a connection via Highway 2A to 50th Street and into the town's existing trail system to the south edge of Innisfail, a connection along the Calgary and Edmonton Trail from the north edge of Innisfail to Dodds Lake and into the existing network to the south edge of town and a connection along Highway 54 from the northwest edge of town to the south edge of Innisfail's town limits. From Innisfail, there are also three proposed routes south to Bowden through the county ranging in length from 10.8 to 12.5 kilometres. The first route would go from the south edge of Innisfail west on Cottonwood Road to Rge. Rd. 10, south to Highway 587 and then west on the highway to the northwest edge of Bowden. The second route would also follow Cottonwood Road to Rge. Rd. 10 and then turn south on Rge. Rd. 11 to the north edge of Bowden. The third route would follow the Canada Pacific Railway line to the northeast edge of Bowden's town limits. Since Bowden has limited trail connections within its boundaries, the community would rely on existing parks and roadways to connect the network in the north to the south edge of the town. Aside from the obvious health and recreation benefits, such a network could become part of the Trans Canada Trail, a system currently spanning 16,800 kilometres from Newfoundland to the West Coast, and therefore lead to increased tourism and economic development in the region, the consultants' report states. The cost of building the trail system could range anywhere from $29,800 to more than $6.2 million depending on which route options are chosen while annual operating costs would range from $29,800 to $209,250. Bowden, Penhold and Innisfail have "expressed an openness to be involved, to some degree, in the ownership and operations of a regional trail," the report states. The county, however, has indicated it is not interested in ownership of the trail system but "may be willing to invest in a shared regional trail system." Because most of the trail links between the communities run through the county, and because of the county's position on system ownership, the consultants state in the report that the best course of action would be for the creation of a partnership between the three municipalities with "potential volunteer/non-profit group involvement" to own and operate the trail network. The partnership would then need to form a "trails corporation" governed by a board of directors to manage the network. The report also lays out a series of next steps for the potential development of the trail system concept. Each community would first need to confirm an interest in exploring the concept further and then carry out public consultation while guaging interest from groups and organizations that could be affected by the construction of the network. From there, the communities involved would need to identify preferred trail routes and begin finding cash for building and maintaining the system. Such money could come from the municipalities or grants from various levels of governments and organizations such as the Trans Canada Trails Foundation. While Bowden, Innisfail and Penhold councils have looked at the consultants' report and approved it in principle, Red Deer County council is scheduled to look at the report next month. Olds' network of paved trails was extended by two kilometres after the Richardson family completed work on trails as part of the development of the Highlands subdivision in the southwest section of town. The Richardsons, who own Richardson Brothers Construction, completed the trails as part of the broader Highlands development, which was given approval by town council in the form of an Area Structure Plan in May 2008. The new sections of trails were completed on July 1. The new sections of trails connect to the existing length of paths through the Deer Ridge Environmental Reserve near Winter Lake and a new stormwater retention pond in the northeast corner of the Highlands subdivision and links to a trail along 63 Avenue. "I think (the Richardson family) has done a heck of a job there. They've tied them into the existing tree reserve and the trails that come back around on 65th (Avenue)," said Larry Wright, the town's director of operations. The new trails fit in well with the Parks and Trails Master Plan that the town is currently working on, he added. That plan is currently being refined, with more public input expected in about two months. The community now has 16 kilometres of paved and mulch trails, including trails at Olds College, and the town expects to add about a kilometre's worth of tie-ins from other portions of trail later this year. From left to right: Carol Simpson, Town of Blackfalds Councilor; Melody Stol, Mayor of Blackfalds; Betty Ann Graves, TCT board member; (behind) Dana Kreil, Lacombe County Councilor; Paula Law, Deputy Reeve Lacombe County; Linda Strong-Watson, executive director of Alberta TrailNet; Debbie Olsen, President Central Alberta Trails Network; Ken Wigmore, Reeve Lacombe County; Rod Fox, MLA; Cliff Soper, Lacombe County Councilor; Blaine Calkins, MP; Kelly Turkington, Acting Director of Operations, Lacombe Research Centre; Reuben Konnick, City of Lacombe Councilor. A unique Trail opened in Central Alberta on June 15; the eight-kilometre Lacombe County Trail is a fully paved path stretching through rural countryside to connect the towns of Lacombe and Blackfalds, and features interpretive signage, a boardwalk and a gazebo. Trail-opening celebrations took place at the Lacombe Research Centre, a 106-year-old Agriculture Canada facility that sits in one of the densest and most diverse livestock production regions in the country. TCT board member Betty Anne Graves, MP Blaine Calkins (Wetaskiwin), MLA Rod Fox (Lacombe-Ponoka) and Lacombe County Reeve Ken Wigmore spoke at the event and heard from enthusiastic Trail users and builders about the importance of this Trail to their community. Debbie Olsen, president of the Central Alberta Regional Trails Society, commented on the significance of the Lacombe County Trail in the bigger picture of Trail building in the province. "Lacombe County is a leader amongst rural municipalities when it comes to trail development in rural Alberta," Olsen said. "There have been other rural trails developed in our province, but none built to this standard and none in a highly populated area. "We have certainly appreciated the support of TCT and Alberta TrailNet in making this Trail a reality and we are hoping this success will help to spur on Trail development in rural municipalities through the prairies." Some of the interpretive signage was created by Grade 5 students, who researched and wrote about the local flora and fauna; the hope is that the Trail will become a regular part of local school curriculum. The Lacombe Research Centre's interpretive sign explains its history as one of the oldest federal research stations in Canada. "Building a new Trail is a labour of love for your community, and that's a good thing, given all the challenges it presents," Graves said. "It took a great deal of resourcefulness and determination to get this section of Trail built and on behalf of the Trans Canada Trail, I commend the hard work and commitment shown by Lacombe County, Alberta TrailNet and its determined executive director Linda Strong-Watson and the Central Alberta Regional Trails Society." The Trans Canada Trail is proud to have contributed nearly $290,000 to this $1.13-million project. TCT has invested more than $2.5 million in Alberta Trail over the years. The Trail in the province is 58 per cent connected. In fact, since 1992, more than 1,700 kilometres of the Trans Canada Trail have been developed in Alberta; there are still more than 1,200 kilometres to go in the province to reach full connection. The TCT is on a bold mission to connect the Trail from coast to coast to coast by 2017. For more information or to support projects like the Lacombe County Trail, please visit tctrail.ca. I have heard very positive comments and one or two negative comments. From that I assume that either a majority of the residents of Lacombe County are in favour of the trails or don't know anything about them and where they are. I must admit in the beginning I was not in favour of trails, who would use them, will there be a lot of trash left along the way and so on. But I must admit, I have traveled along the Bentley to Gull Lake trail for many years and have yet to see trash, yet I see many using the trail from the time the snow goes till it returns, which some years is not long. According to statistics we are told an apple a day will keep the doctor away, well maybe we can also say "a trail a day will keep the doctor away." Fresh air and exercise is supposed to be good for us and what better way to get it than on the TransCanada Trail. Besides a great hike this trail has been developed as an interpretive trail, there are signs describing different areas along the way. This trail is just one part of the larger TransCanada Trail, which was initiated in 1992 as a project to celebrate Canada's 125th year. The TransCanada Trail, when completed, will be the world's longest network of multi-use recreational trails and will stretch 22,000 kilometres from the Atlantic to the Pacific and to the Arctic Oceans, through every province and territory, linking over 1000 communities and more than 33 million Canadians. Through the dedication of County Council, our staff and numerous volunteers, this trail has been built with the hopes of inspiring people to become active and enjoy the outdoors. We are proud to be leading the province in rural trail construction and we hope this is only a small part of what is yet to come. We invite you to bring your family, friends and neighbors and enjoy the trail and the beauty it has to offer - but please be respectful of the land along the trail, for if it had not been for those people giving up a small portion of their land, this project would not have happened. In closing I will leave you with this thought: "park the car, take a trail." Have a great trail day. The grand opening for the new Lacombe County Trail connecting Lacombe and Blackfalds was held on June 15 and attendance was excellent despite blustery weather. About 100 people turned out to watch Lacombe County Reeve Ken Wigmore officially cut the ribbon and open the trail. "This trail would not have been possible without the combined efforts of many people," Wagmore said. "We are very privileged to have the Trans Canada Trail here in Central Alberta." The new Lacombe County Trail is perhaps the finest example of TransCanada Trail to be found in a rural area in the province of Alberta. Highlights of the trail include a boardwalk, a gazebo, a picnic area and a natural area near Lacombe Lake. Interpretive signage about agriculture research, flora and fauna is also a trail highlight. "Building a new trail is a labour of love," said Betty Anne Graves of the Trans Canada Trail organization. 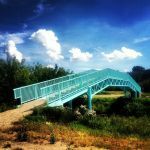 "It took a great deal of resourcefulness and determination to get this section of trail built, but it will be here for residents to enjoy for many years to come." In recognition of their outstanding efforts, this past fall, Lacombe County was awarded the prestigious Trailblazer Award by Alberta TrailNet, the organization responsible for trails within the province of Alberta. It was the first time the award had ever been given to a single municipality. JJ Collett Natural Area recently finished a new boardwalk, giving access to a section of the trails that, due to flooded lowlands, hasn't been easily accessible since 2008. Society vice-president Roger Stawart says now people can easily get to the northwestern part of trail seven without damaging the environment. "It's a pretty valuable ecosystem and we didn't want it trampled." The area is covered with standing water year round and grows several types of trees, flowers and a herb called horse tail; which dates back to prehistoric times where they grew to the size of modern day trees. Construction of the boardwalk began in March when the screw pilings were put in and erection of the actual structure started early May. Stawart says the project wasn't always easy because of Alberta's weather and it was president Jack Surbey who made it possible. "He conducted us all the way through the job. We would not have done this without Jack Surbey." At times the wood materials had to be pulled through a foot of standing water just to get to the construction site; once Surbey took his truck in there and almost couldn't get it out again. The construction workers, many of whom were volunteers, were sometimes working in knee-deep water and hip-waders. "It's really a completion of trail 7," said Stawart, referring to the northwestern part of the trail. He feels trail 7, and several other parts of the natural area have something special to offer, especially with their sand dune topography. "Sand dune topography is really topography . . . left over from the ice age." Later in the summer JJ Collett Natural Area members are planning to have a grand opening for the boardwalk. Red Deer may boast an extensive trail system, but neighbouring Lacombe County recently added a stretch of trail that is unique in Central Alberta. The Central Alberta Regional Trail Society officially opened a new leg of the Trans Canada Trail System. This rural path stretches from Lacombe to Blackfalds. Debbie Olsen, Central Alberta Regional Trail Society president, said this means that it is possible for someone to cycle from Lacombe to Blackfalds without having to risk their lives on the highway. "This trail is paved all the way to the boundary of the municipality of Blackfalds," said Olsen. "Then you go on the edge of a gravel road, which we're hoping to fix that part and get it to be actual trail, but you can take the Town of Blackfalds trails around and at the other end we have trail that connects all the way to the municipal boundary of Red Deer." 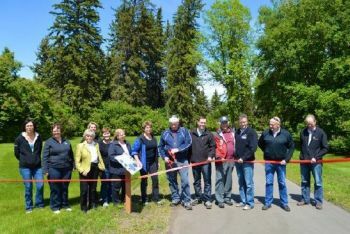 The trail was officially opened Saturday along a section of the trail located at the Lacombe Research Centre off of the C and E Trail. As the trail is entirely rural, those who were behind its completion had to negotiate with land owners to set it up. "Before it was paved last fall we had people using it and I hope it will be used more and more," said Olsen. "We did a lot of neat things with regards to the signage along the trail, which just went up last week." The signs talk about different parts of the trail, for example the ones at the Research Centre site talk about the centre's history and other aspects of it. At the Lacombe Lake site there is a boardwalk and a gazebo. On some signs Grade 5 students were recruited to write about the flora and fauna and research it properly for a sign. Olsen said Albertans contributed more per capita than any other province in Canada to build the Trans Canada Trail. "But, we have less trail than any other province in Canada," said Olsen. "Part of the problem is it has been difficult to get trails through rural areas." The concerns have been around vandalism, litter or trail related trouble. "When I say this is the finest example of rural trail in the province, it is," said Olsen. "What we're hoping is this section of trail will help spur other rural municipalities to want to connect." Interpretive signs will be going up this week on the Lacombe Lake Trail, the new Lacombe County trail that connects the City of Lacombe with the Town of Blackfalds. When you go for a walk on the trail and check out the signs. Keep in mind that the signs describing the flora and fauna along the trail were in part designed by local grade five and grade six students as part of their curriculum. Students from Mrs. Marlene Ironside's grade five class at Ecole Lacombe Upper Elementary and Mrs. Jenkins' grade six class at Terrace Ridge school provided input on the content of the signs. This past week, they were out on the trail taking a closer look at the surrounding flora and fauna. Representatives from the Battle River Watershed Alliance, Lacombe County, the Lacombe Research Centre and the Central Alberta Regional Trails Society (CARTS) worked together to plan an exciting day on the trail for the students. "We had a lot of fun playing games that helped us learn about the animals that live in the Parkland," said grade six student, Saidi Hansen. "But I think my favourite thing was hiking through the natural area beside the lake. We saw loons and ducks and learned how to identify some of the flowers, shrubs and trees." Area residents are invited to come celebrate the new trail, take a look at the new signage and discover the flora and fauna for themselves at a grand opening ribbon cutting event hosted by Lacombe County and CARTS on Saturday, June 15 at 2 pm on the front lawn of the Agriculture and Agri-food Canada Lacombe Research Centre. After a short ceremony, there will be a free barbecue and plenty of time to explore the new trail. 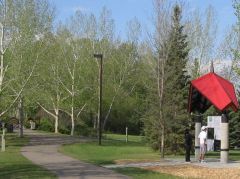 The Lacombe Lake Trail is part of the Trans Canada Trail system, the world's longest network of multi-use recreational trails. When completed, the Trans Canada Trail will stretch 23,000 km from coast to coast in every province and territory. Albertans contributed more per capita than any other province to the building of this trail. Alberta TrailNet Society is Alberta's provincial trail council, a non-profit charitable organization supporting the ongoing development of Alberta's provincial trail network, including implementing the Trans Canada Trail. Alberta TrailNet works with the provincial trail associations, municipalities, stakeholders and the Government of Alberta to support trail projects throughout the province. A number of volunteer trail opportunities are available, including construction, stewardship, writing newsletters and working at tradeshows. To volunteer with your local trail organization, contact Alberta TrailNet at atnadmin@telus.net. Each year, thousands of volunteers dedicate the time and energy to creating a trail network in our province. Here's just a few we'd like to say thank-you to. Debbie Olsen has been involved with the Central Alberta Regional Trails Society for over a decade. Working with trail development groups, the Central Alberta Regional Trails Society (known as CARTS) is a volunteer-run organization that provides trail information and support to Central Alberta. Debbie has been serving as the association's President for the past five years. Getting involved in trails was a natural fit for Debbie, as she was already a trail user. "I've always enjoyed exercising and going for walks with my family. It's something anyone can do ... and there isn't a monthly fee like a gym membership," says Debbie. The Central Alberta Regional Trails Society coordinates trail development in Central Alberta. It is made up of many volunteers, trail groups and municipalities, including: Red Deer, Lacombe, Bowden, Springbrook, Red Deer County, Olds, Lacombe County, Innisfail, Ponoka, Blackfalds, Bentley, Penhold, Alix and Ponoka County. "It's a great example of urban and rural municipalities working together and talking about trails. 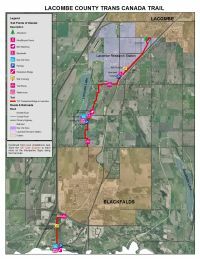 A new section of trails is opening June 15 that will connect Blackfalds to Lacombe," says Debbie. "It's great for people in the area to have another recreation site to spend time with their family. It's also important to have a form of green transportation from one community to another." As President of CARTS, Debbie coordinates bringing together the committee, meets with sub-committees and addresses concerns of municipalities. She's also involved in writing the interpretive signage for the trails. "I'm really excited to be part of CARTS. I've always been interested in trails and green spaces," says Debbie. "CARTS has had years of success before I was involved. That was thanks to the many volunteers, creating awareness by going door-to-door in Red Deer County." Bringing Central Alberta's municipalities together also provides an opportunity to learn from each other's experiences. "The Town of Sylvan Lake was using a new trail surface," says Debbie. "Through CARTS, we were able to share information and see if other areas would benefit from this surfacing technique." Phil Lodermeier is Lacombe County's Manager of Operations and is heavily involved with CARTS. "The trail system is something that's really important to our residents," Phil says. "It's fun being involved in planning trails, putting in washrooms, picnic tables ... benches. There's a lot of budgeting and planning involved, but it's worth it. When we built the boardwalk on the lake ... the view is spectacular. Every picture of the area is amazing." Collaboration and partnership are keys to successfully completing trails in Central Alberta. "We were working on a trail from Blackfalds to Red Deer and we needed to build a bridge, "says Phil. "We brought in the military engineers to construct the Blindman River Pedestrian Bridge. We had Boy Scout troops and school groups come out to see this. It was a great opportunity for the community to learn how trails are created," adds Debbie. Central Alberta is blessed with side views, rolling hills and stunning sunsets. "Using the trails is a great way to enjoy the natural beauty of Alberta," says Debbie. "It's satisfying knowing that when you're walking on a trail -- that you were a part of it. I'll be riding my bike on the trails and someone will say, 'Hey, did you know you can ride all the way to Red Deer?' And I'm thinking, 'Yeah, I was involved in this!'" Phil notes that there are obstacles involved in building trails. "It is a long process to negotiate the land purchases. It's easy for people to understand hard services like building roads when you're talking about infrastructure," says Phil. "So you have to keep your goal in mind because it's worth it in the end. The trails will provide enjoyment for years to come." For her amazing contribution to trails in Central Alberta, Debbie received the Queen Elizabeth Diamond Jubilee Medal. Across the country, community leaders have received this award in recognition of their outstanding service and citizenship. The new commemorative medal was created to mark the 60th anniversary of her Majesty Queen Elizabeth II's accession to the Throne as Queen of Canada. Debbie is excited to continue working with CARTS to create a trail network across Central Alberta, though she has a larger goal in mind. "It's such a beautiful area, biking near Lacombe Lake. The trails we're building will definitely be a tourism asset," says Debbie. "It's great to know it's going to be there for a long time and my kids will get to use it. I would love to see the entire province connected by trails." For more information about the Central Alberta Regional Trails Society and to get involved, visit www.centralalbertatrails.org.